Looking for nautical books? 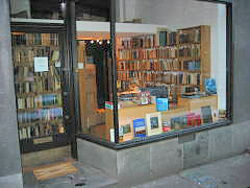 Biblio.co.nz hosts hundreds of of the finest online book stores and booksellers, including specialists in nautical. Use the list below to locate a specific specialist bookseller or book store near you. Or, use the form below to search the inventory of all booksellers who specialize in nautical. We handle books from academic libraries (from institutions and scholars), both deaccessions and gift books from alumni, and from closed Seminary Bookstores. Our original location was on a remote island in Maine, the Island of Frenchboro, and thus the origin of our name. For a time we operated a brick and mortar store in Bangor four days a week, and then moved that to the Antique Marketplace on Main Street in Bangor, which still caries some of our stock. The major stock of our business is now housed in Louisville, Colorado. Our listings can include a wide range of material, but the majority are non-fiction, scholarly works.